Designed for rapid PCR amplification - you can complete your PCR in as little as 30 minutes. It is a robust mix for all your everyday PCR applications including genotyping, screening and library construction. 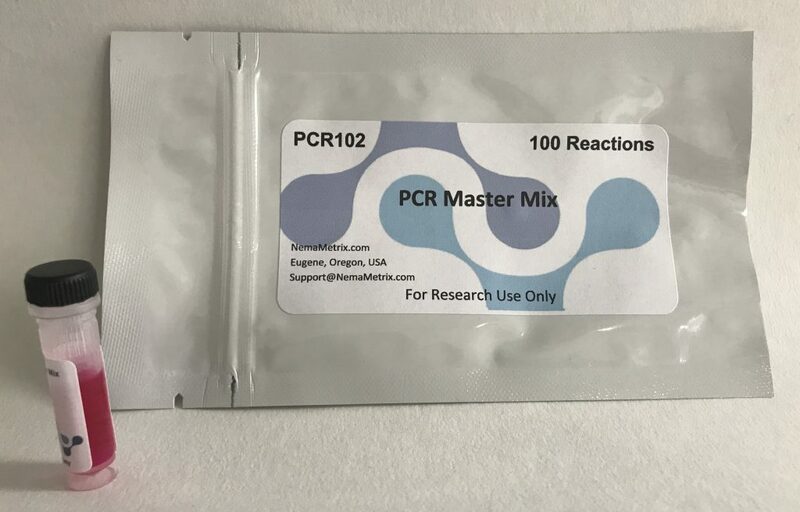 Unlike typical PCR which can take as long as two hours due to longer extension times, the Master PCR Mix is a convenient, ready-to-use mix that contains buffer, polymerase and dNTPs to make running the PCR easy, and a loading dye to save a step while loading the reaction onto an agarose gel. Much shorter extension times mean that your PCR is done faster. PCR only takes 45 minutes with the NemaMetrix master mix instead of the traditional 150 minutes for 2,300 bp amplicons. ● The Master Mix is all you need to get started! Just add your primers and template. ● 1 second extension time for amplicons under 1kb. PCR amplification using the Master Mix. 1.5% Agarose gel. 2333bp and 1047bp product was amplified using HS Red Taq PCR Mix with a 45 second extension time.